I started reading about VM research around September 2015, some two and a half years ago now. I had read a short article before about the “world’s most mysterious manuscript” some years before, and wondered: did they solve this thing already? And if not, what is known about it? After some browsing, I learned the answers to those questions: no, and not much. Reading through the available sources, I quickly became interested in the work of two researchers in particular. First, from Diane O’Donovan’s work I learned that the manuscript’s imagery cannot be properly understood from the assumption that its contents are a purely 15th century creation. Of course, all art forms carry their history within them, but the VM simply won’t make sense without thinking in terms of its various chronological strata. I also liked Diane’s work on plant mnemonics, and understood this as one of the reasons why the plant drawings in the MS look unusual: at one point they have been altered to incorporate visual memory-aids. Secondly, I was influenced by Stephen Bax’s work, specifically the method he employed. If a particular plant is an onion, then there’s a good chance the word next to it will read “onion”. One problem with this, however, is the number of uncertainties involved. For example: Did I identify the plant correctly? Does the VM text contain any linguistic information or is it generated nonsense? If so, which language is it in? Do the images and text belong together? Are plant names mentioned in the text? Did I select the correct word from the text to be my “plant name”? Many of those uncertainties must be accepted for what they are, but a few of them can be eliminated by shifting the focus from the large plat drawings (with one to three paragraphs of text) to the small ones (with a single label). If you’ve got a drawing and one word next to it , there’s a decent chance that this one word is the thing’s name. Find out what the drawing represents, and you know what the name should be. Even if the name is encoded in a complex way, you might still gain some insights . A row of neatly labelled plants, for your mystery-solving convenience. My impression was that the small-plants section had been understudied and its potential underappreciated at that time (ant it still is). Most researchers rarely ventured into that section, and if they did it was for the ornate “vessels” depicted in it, not for the plants themselves. So in front of me was basically a blank slate. With this, it is established that there are mnemonics integrated in the plants. But while Diane, writing about the large plants, discussed mostly mnemonics related to the use of the plant, I hypothesized that these were about the foreign (or “international”) names of the plant. It is not uncommon for plant books to include relevant translations and glossaries existed as well , so some kind of illustrated lexicon is not too crazy of a suggestion. Mnemonic techniques are essential to those who have to memorize a lot – which explains why they were ubiquitous in the past, especially before we were able to mass-produce books. However, there are still occasions where mnemonics come in handy. For example, if you want to learn Japanese script (hiragana), mnemonic images can help to remember their sound value, and indeed several mnemonic charts are available online. Normally my memory is not the best, but by using some of these mnemonic images, I was able to memorize all basic hiragana in no time, with decent long-term memorization as well. The potential of mnemonics depends on the learner’s language. I can draw and imagine Japanese “to” as “a toe with a splinter on it”, but this mnemonic will only work for people who speak English, as it depends on “to” sounding like “toe”. It doesn’t have to be their first language (it’s not mine) but they must be comfortable with it. In short, many mnemonics will only work in one specific language. To show that visual mnemonics, as they are employed in the VM, are not something strange or fanciful. It is a well established learning technique that is still used today. It’s not just some weird fantasy, but rather a didactic solution tailored to specific needs. So then in March 2016 the time was right to start publishing some of my ideas on a blog. Since many of the mnemonics I discerned were related to Greco-Roman myth, I decided to call it “Herculeaf”, a contraction of the demigod Hercules (from Greek myth) and leaf (from plants). It seemed like a good idea at the time, though now I wish I’d chosen something with “Voynich” in the title – ah well. Ideally, a complete analysis explains how the mnemonic helps to remember the plant name. In what follows, I will review my early posts on small-plant mnemonics and rate their reliability as I see it now. Here it’s clear that the mnemonic is a hand. The plant ID is, as usual, up for debate, but I still find leek a good possibility. Apparently Egyptian leek, kurrat, was especially valued. This gave me the idea that Greek might be the underlying language of the mnemonics, since Greek for hand is kheir. The exact pronunciation depends on the time, region and accent of the speaker, interpretation of the foreign name etc, but all in all it looks like something which might work. This might also have been the point where I completely abandoned the idea that Voynichese may be the result of one-to-one substitution. If this label is to read something like /kurat/, then the “cc” in the middle must be some kind of ligature that stands for /ur/, and the last glyph a word-final version of /t/. All in all I’m still behind this analysis. I’m not too certain anymore about this one. On the one hand, it is absolutely clear that the plant has been modified to fit some symmetrical scheme. 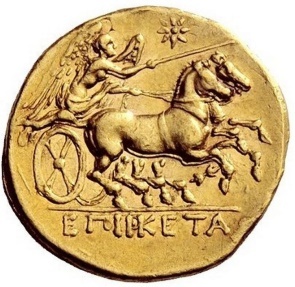 I saw in this the two Dioscuri, traditionally depicted riding next to each other, with lances and billowing cloaks. I’m still okay with this, though I’d welcome other suggestions. I’m not certain at all anymore about my further interpretation of plant ID, mnemonic link and label reading. It confirmed that I was on the right track seeing the section as an illustrated lexicon, and assuming Greek as the language the maker/audience was thinking in. I’ve mentioned this post before on a number of occasions so won’t go into detail here, but basically the mnemonic works because the Greek word for hawk, /kirkos/ sounds like some of the international names for Saffron (related to Crocus), using the K-R-K consonant structure. I’m feeling less certain about this one now that I did before. Both the mnemonic and the plant ID are a bit uncertain, since there’s not much to go on – a bunch of flowy roots and a white spike. A redeeming quality is that /nike/ would make a decent mnemonic for the local name for finger millet, as explained in the post. I still stand behind this post, although the plant ID is a difficult one. It assumes that the bulbous roots are entirely mnemonic additions and the actual focus is on the sticks above ground. The unusual thing about the drawing is that the bulbs have two “roots” each, enhancing the impression of intended anthropomorphy. The idea is that the word for Grace, /kharis/, will help to remember the “international” word for sugar, /zakhari/. It’s not bad, and I was able to make some sense of the label, in part. Looking back at this image, I think the Golden Fleece is a plausible mnemonic. Unfortunately it’s pretty useless without a better idea of which plant is meant. Like the previous one, this post certainly isn’t among the best, although I’m still okay with the mnemonic. Somehow I thought the plant should represent teak, and while this is not the worst possible idea, there should be better ones. The link between mnemonic and supposed plant ID and label interpretation is all rather shaky. I still feel very confident about this mnemonic. As a reminder, I saw this and the plant next to it as a pair, illustrating the story of Hercules who chains the hell hound Cerberus and drags him into the open, causing the creature to vomit bile because of the sudden exposure to sunlight. Always wear sunscreen, folks. You know, it’s ridiculous, but precisely that would make it an excellent mnemonic. In the follow-up post I explore some possibilities for the label, which I still like as well. Unfortunately I must still mark this one as incomplete, but it’s got potential. This one, the plant on the right, got me started on this folio and launched the hypothesis that its mnemonics were connected to mythological tales. The connection to Hercules made the thematic link even stronger. Unfortunately I didn’t get much further than a weak suggestion for the plant ID. I love the way this mnemonic has been drawn, it’s incredibly clever. It’s a shame the story of Cadmus isn’t better known and more present in visual culture, otherwise this would be recognized right away. In short, Cadmus slew a dragon, scattered its teeth in a field, and five men came out. The roots of the plant have been brilliantly shaped like a furrows in a plowed field, from which five men emerge. At the far end of the field we see the tree to which Cadmus pinned the dragon with his sword. This is one of the mnemonics I am most determined about. Unfortunately, the botanical information that’s left in the drawing appears limited to the shape of the leaf. It’s a characteristically shaped leaf though, so perhaps it can be identified some day. I find it hard to judge this one. The mnemonic, label and plant ID tie together nicely. On the other hand, the drawing isn’t the most obvious one, so I’m hesitant to express much certainty. I started off this post with some background on my views, but this was really in the beginning of my Voynich days and some things have evolved now. But the interpretation of the mnemonic is really good, and I like that it matched part of the label (/krios/ = sheep). Unfortunately, no suggestions for plant ID yet. This post still makes a lot of sense to me, even though the plant is rather obscure. It was really shocking when I googled the word suggested to me by mnemonic and label, and I got rather quickly to a plant with the exact same leaf shape. So well, there you go. Since a few people had asked me about these older posts, I thought it would be good to list them here and add my current thoughts. There were five of them where I expressed my doubts about their reliability. All in all though, I still stand behind the concept. Above all, there are a few instances where I believe I was able to “read” the label to some extent. Doing this and comparing various labels formed my opinions about what Voynichese can and can’t be. In particular, I think it was originally a cursive or perhaps a minuscule with positional variation. This has then been copied and fitted into a structure with a more rigid appearance. I don’t know whether this process was intentional (to simplify or to obscure) or accidental (because the scribe was unable to parse the exemplar text correctly). Even though in my view this must have led to some loss of information, I still maintain hope that enough is left to eventually work out its meaning. It’s a shame that the plants in the small-plant section are so difficult to identify – perhaps not mainly because of their size, but because of the scarcity of clear botanical information they convey. Otherwise it would be a perfect place for image-guided deciphering attempts. If the VM does contain retrievable information and we ever manage to break its shell, I would not be surprised if the first cracks show up on the small-plants foldouts. Some labels have more than one word, which has been seen by some as an objection to their being plant names. But of course the name of a plant can consist of more than one word. Additionally, some of these words are repeated in several labels. This, again, is not a problem, since the repeated words could be adjectives: “large x”, “large y” (or “small, red, wild, sweet….”). In fact, Neophytos Prodromenos, a focal figure in a recent post, produced a lexicon of Arabic plant names and their transliteration into the Greek alphabet, which Touwaide calls the best example of this type. This is a lot of information for one blog! Some comments on the first plant (the one that has the hand-root)… I agree that this is probably intended as a hand and that it is probably a mnemonic. It is, in fact, a fairly common mnemonic in herbal manuscripts. The leaves of Ricinus and palm trees look nothing like the VMS plant, but the orchids do, and Dactylorhiza maculata (heath spotted orchid) has a root that looks like a palm (less bulbous than most orchid roots, with fingers). In fact the old name (in Besler’s time and before) for some of the orchids with this hand-shaped root was Palm Christi erecta and there are quite a few drawings in the “alchemical” herbal manuscripts that depict plants named Palma Christi that are surely orchids (some are spotted orchids and thus easier to identify). The VMS mnemonic doesn’t necessarily follow traditional herbals, but if it does, this plant is more than likely an orchid. Thanks for your replies, JKP, it’s always nice to have the opinion of someone who knows much more about plants than I do. On Palma Christi I’m not entirely convinced, though. The Palma illustrations I can remember properly show an open hand, revealing the palm as the name suggests. This hand, however, averts the palm and is somewhat closed. That is the reason why it seemed to suggest more “hand” in rest, rather than “palm”. For Dioscuri, I thought the “leaves” may actually be fruits in which case it could be mango. But I don’t see enough evidence anymore to support that theory. Plants with “Dioscor…” in the name are interesting though, and I hadn’t considered them yet. But would those have been their historical names or modern ones? If it’s not a reference to Castor and Pollux, then there are indeed still many more possibilities. If you count the legs, you’ll see that we’re looking at a biga though, not a quadriga (Sol). What I find really convincing is that there are four legs down and four legs up, which is an iconic way of depicting two horses running side by side. Google biga coin for many examples. https://images.vcoins.com/product_image/200/D/5/dBe8fy9P3GSzkQ2N4JXtSLq5jX6GD7.jpg (it’s a Nike in a biga). … or Martagon lily (in medieval times they didn’t make a big distinction between orchids and lilies, so a lily is also possible, but most of the medieval drawings with palm-roots are orchids). I think you might be right about this being a chariot-horse mnemonic. You didn’t mention a corresponding plant so I’ll suggest that it might be Dioscorea communis, which is a Mediterranean vine with fat fingerlike roots and heart-shaped leaves that MIGHT be drawn as the VMS leaves are drawn. IF the mnemonic is the Dioscuri and IF it’s a reference to the name of the plant, then other plants that might be drawn like this are Althaea dioscoridis, Dioscorea pyrenaica, Acinos dioscoridis (which we know as Tulsi/Holy basil). There are other plants that have Dioscor… in the name but their leaves don’t look like this plant. Maybe Asclepias dioscoridis could qualify, but it is more palmate. And then there’s the possibility it’s not a reference to the Dioscuri at all, but perhaps to Helios or Apollo and that opens up a rather large number of additional plant names. This plant we see differently. I don’t think it’s saffron or any kind of crocus. I think the mnemonic is a snake’s head and tongue and a reference to Adder’s Tongue (Ophioglossum vulgatum), a circumboreal species which actually looks quite a bit like the drawing, with a wheat-like bumpy flower spike. The roots of Ophioglossum vulgatum are medium-thick tendrils, not as thick as the VMS drawing, but the same basic shape. Ophioglossum lusitanicum (least Adder’s Tongue) has multiple leaves (usually two, but sometimes more). This species is Asian but it has been found growing wild in Britain and Ophioglossum is, in general, a global species, so it MIGHT have reached the west by the Middle Ages. Ophioglossum engelmannii usually has two leaves and two spikes tangled up together so they almost look like one plant. This is a New World species as is Ophioglossum petiolatum, which sometimes has three leaves. Ophioglossum is a very cool plant, a unique form of unfernlike fern so adaptable it can be found both in the tropics and the arctic. It is included in many medicinal herbal manuscripts, including Harley 3736, ONB 5264, Canon Misc 408, and several more. It is not typically drawn using mnemonics because it is so recognizable but the VMS is different, and maybe would draw it this way. There are other plants with rattle-snake-tail flower spikes, but Adder’s tongue is at the top of my list for this drawing. I googled adder’s tongue, such a cool plant. If you take the “tongue” of the VM plant at face value (no pun intended) then I can see well how you’d think it’s this plant. what makes me stick to krokus, and then probably saffron because of the large protrusion, is that one “flower” is closed while the other is open. In Adder’s tongue this would make less sense. Either way, for both interpretations some form of inaccuracy and/or mnemonic morphing must be assumed, so it can go either way. About the sugar cane (5) I agree that it would be weird if the roots were entirely mnemonic, so you’re probably right there. I do think there is a mnemonic element to them though, since they have been given two “legs”, which is not something expected in nature and points towards intentional anthropomorphism in my opinion. But that needn’t imply that they are entirely made up, as would be the case in my original interpretation. I don’t think this drawing is mnemonic. I think they are common garden radishes (the red and white ones). There are three or four different kinds of radishes represented in medieval herbals, even the long white ones that I tend to think of as Asian radishes. Since they are small and one often pulls up several at the same time, it would be reasonable to drawn three together. I could be wrong about them being radishes,, but that’s my hunch. I agree with you that it looks like a monkey (or ape), especially the pose and the feet. There are many plants associated with monkeys but most of those with palmate leaves are in South America, so I won’t list them. In addition to what you suggested, I would like to add the Monkey-bread tree (Adansonia digitata). It grows everywhere in India and African (except parts of the northwest Africa) and has digitate leaves (usually six fingers). You have made a good summary, I hope it is well tagged too. If I type in the search box the page number, will I be able to find your old or new proposals or comments? P.S. I like your enlarged images, they often give me new ideas.